As this project evolves, I've discovered that I've grown as interested in prototype paperwork & ephemera as in the modeling itself. Of course, things like employee timetables, engine assignment books, and other paperwork inform prototype operations. But even other items like locomotive operation manuals - while not very relevant to a model railroad - certainly make for interesting reading, and may even enrich your operating experience further. ... which I enthusiastically added to my collection. But one thing I saw, that I really, really wanted ended up not being for sale . . . Thanks very much to MelR for the pic. I was apparently too gob-smacked to think of taking one myself. 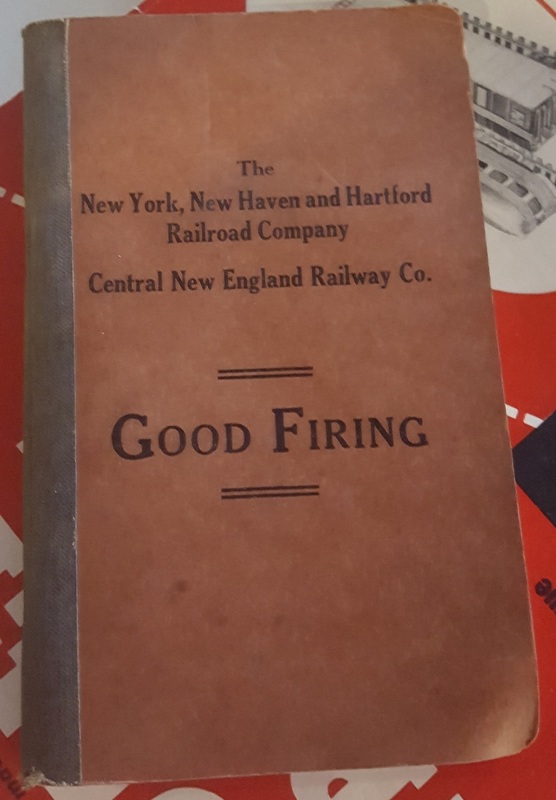 This is a firing manual for the New Haven Railroad (and Central New England Rwy) dating from the 1920s. I expected such a thing existed, but I'd never actually seen one before. Now that I know it exists, I'll be on the lookout. In the meantime, maybe the owner will change his mind . . .
Long time readers of this blog know that one of the primary inspirations for my Valley Line project is John Wallace. His photos and reminisces of firing on the Valley Local during the late 1940s has enriched the entire project. He also put me on the scent of something else I never knew existed. A later version of the New Haven's official steam locomotive firing manual! As a fireman on the present-day Valley Railroad, either booklet would be highly prized. John said he'd been given one by Ted Michalicki, one of the regular firemen on the local, but it'd been lost to time. I knew there was a copy at the UCONN library, but ever since he mentioned its existence, I'd been on the lookout for one myself. Finally, one showed up on eBay. And I got it. I haven't read through it yet, but even just flipping through is pretty cool. The illustrations are really neat and informative, but the most interesting thing I've discovered so far is the publication date - 1946. On my website (you do know there's a website that goes with this blog, don't you? ), I have a page describing the End of Steam in the Connecticut Valley. On the New Haven Railroad, at least, 1946 was just about the last year of steam. Their newest steam locomotives - the I-5 Shoreliners (4-6-4) were almost 10 years old by then. Seems strange that they would have devoted any resources at all to producing a new manual on how to fire a steam engine. But I'm glad they did. While the relatively-small 2-8-2 I hand fire is no match for a stoker-fired Hudson, it'll still be neat to sit by the fire and see if I can't get a few tips on how to use my "new" NHRR coal scoop.